Barcelona icon Lionel Messi broke Cristiano Ronaldo's incredible record with his sensational display against Real Betis, where he netted three goals. The Argentine genius is also on the verge of equalling another record held by Ronaldo. The 31-year-old magician leads the goal-scoring charts in the European top five leagues and hence, leads the race for the European Golden Shoe. He has scored 29 goals in the Spanish top flight and has been involved in a staggering 43 goals so far in the league. 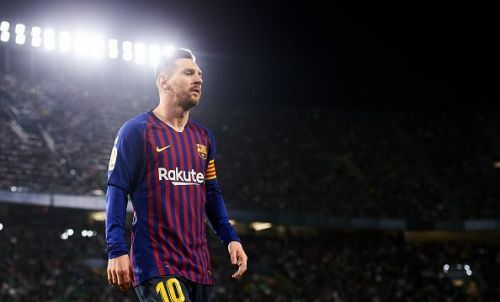 It goes without saying that Messi is enjoying another historic campaign so far, and he reminded the world why he is miles ahead of the rest against Real Betis. His hat-trick included a majestic free-kick to open the scoring, a tap in from a Luis Suarez pass and a great left-footed finish, which earned the admiration of rival Betis fans at the end. On the other hand, Cristiano Ronaldo is enjoying a sensational debut campaign in Italy as he is among the top scorers in the Serie A with 19 goals in the season so far, and leads the assists charts with 8 assists. In the midweek Champions League fixtures, both Messi and Ronaldo displayed that they are still on top of their game. The Portuguese talisman netted a hat-trick to single-handedly take Juventus into the quarter-finals, while Messi scored a brace and provided two assists in Barcelona's win against Lyon. The hat-trick against Betis was Lionel Messi's 45th hat-trick overall for Barcelona, one more than the number of hat-tricks Cristiano scored during his 9-season-long tenure with Spanish giants Real Madrid. It was also Messi's 33rd hat-trick in the Spanish League. With 34 hat-tricks in LaLiga, Cristiano holds the record of most hat-tricks in the Spanish league, but the Blaugrana captain is inching closer to equalling the insane record day by day. In all competitions, the Portuguese talisman is just one career hat-trick ahead of Messi, having scored three or more goals 52 times in his glittering career. It still remains to be seen how long Cristiano's insane record remains intact. The Portuguese is no longer in LaLiga, and it looks inevitable that Messi will break his record sooner or later. Cristiano Ronaldo vs Lionel Messi: Did the Portuguese really conquer Spain?